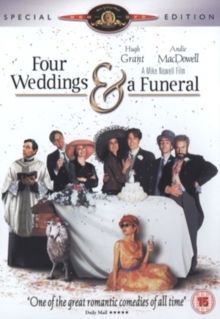 This hugely popular comedy established Hugh Grant as Hollywood's favourite bumbling Brit and garnered Oscar nominations for Best Picture and Richard Curtis' screenplay. Shy Londoner Charles (Grant) meets American Carrie (Andie MacDowell) at a friend's wedding and enjoys a one-night stand with her. The next time they meet, again at a wedding, Carrie is accompanied by a rich fiancé, leaving Charles heartbroken. Nevermind, with another wedding on the horizon, there is still time for him to pitch his woo and win the love of his transatlantic sweetheart. The film spawned not only a hit single for Wet Wet Wet with 'Love Is All Around', but also a best-selling poetry anthology, inspired by an on-screen reading of W.H.